These recommendations are taken from 2017 American Heart Association and American College of Cardiology focused update of the 2014 AHA/ADA Guideline for Management of Patients with Valvular Disease and cited by the ADA. 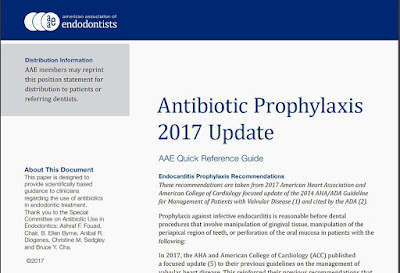 In 2017, the AHA and American College of Cardiology (ACC) published a focused update to their previous guidelines on the management of valvular heart disease. This reinforced their previous recommendations that AP is reasonable for the subset of patients at increased risk of developing IE and at high risk of experiencing adverse outcomes from IE. This paper is designed to provide scientifically based guidance to clinicians regarding the use of antibiotics in endodontic treatment. 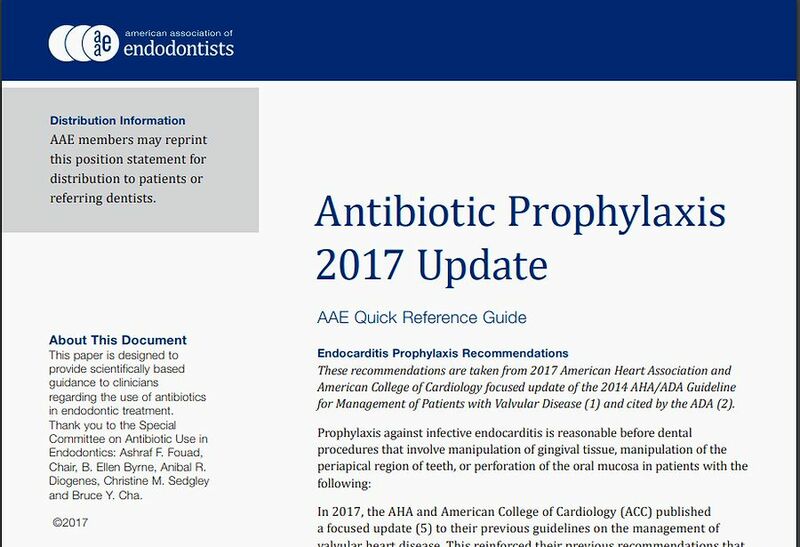 Thank you to the Special Committee on Antibiotic Use in Endodontics: Ashraf F. Fouad, Chair, B. Ellen Byrne, Anibal R. Diogenes, Christine M. Sedgley and Bruce Y. Cha.